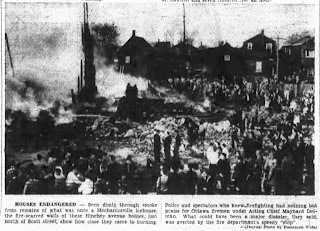 The Victoria Day long weekend of 1956 is likely one that long-time Mechanicsville residents have never forgotten. Tragedy and devastation was narrowly avoided, thanks to the incredible efforts of the Ottawa Fire Department, and a little luck from mother nature. As anyone familiar with the area might reasonably question, the close proximity of the houses in Mechanicsville, along with their simple wood-frame construction (and particularly at the time, the questionable materials used in their finishing - the chimneys, the stoves, the pipes, the insulation, etc. 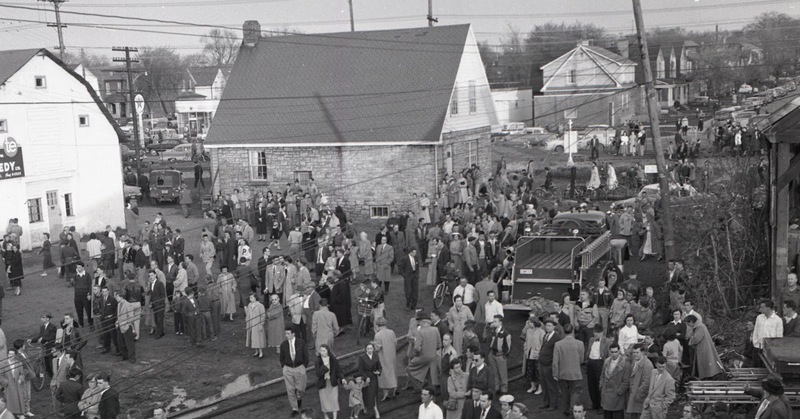 ), how has Mechanicsville made it through 145 years without being wiped out by fire? The answer is, they haven't exactly... fires have been a significant problem for the neighbourhood. Of course, major changes to the building and fire codes, as well as improvements in the homes themselves have minimized the risks in 2017. But up until the 1960s, fires were a regular event in the neighbourhood, and there is hardly a lot in Mechanicsville which hasn't seen a fire at one time or another. Major blazes have taken out a few house at a time over the years, but thankfully (and luckily) there was never an inferno that destroyed the community as a whole. But such a fire was maybe never closer than on the evening of Sunday May 20th, 1956. In late afternoon, three young boys aged seven, eight and ten years visited a corner store in Mechanicsville. As it was the Victoria Day weekend, the store had a large stock of firecrackers on hand. One of the boys had 10 cents on him. He purchased 10 firecrackers for 5 cents, plus a book of matches for another penny. The boys took their purchase to the old Artelle icehouse, located on the east side of Forward, where the Place Allard rowhouses now stand. The ice house was a monstrous building, 60 by 40 feet in footprint, and stood 50 feet high, the equivalent of a four-storey building. These buildings were huge structures, and there had been several in Mechanicsville, where the ice-men of the era had stored they had pulled out of the Ottawa River the prior winter, for sale and home delivery throughout the following spring and summer. With the electric refrigerator becoming an affordable appliance for just about every home in the 1950s, the icemen were more or less out of business. The Artelle ice house had been sold to the Dores in the 1940s, but ceased being used as an icehouse in 1953. It had then been sold to the James Tapp & Sons Construction Company to store construction equipment. Just before 7 p.m., the boys went alongside the building, and set off their firecrackers. They put one firecracker between boards of the of icehouse's outer wall, and into the sawdust insulation. They later claimed they believed the firecracker to be "dead" when the did that. They then left the area, and went to go play on swings nearby. A short time later, they noticed smoke and flames coming from the roof. They ran to the house next door at 191 Forward and alerted Mrs. Ouellette, who was watching television on the main floor. "I went outside shortly after 7 o'clock to find flames slapping our house" Mrs. Ouellette recalled to the newspaper. "My husband was upstairs sleeping and all I could think of was getting him awake." Just moments later the Ouellette's bedroom was a mass of flame. The Ouellette family were in the midst of renovating their home at the time. This was in fact their third tragedy in three years. 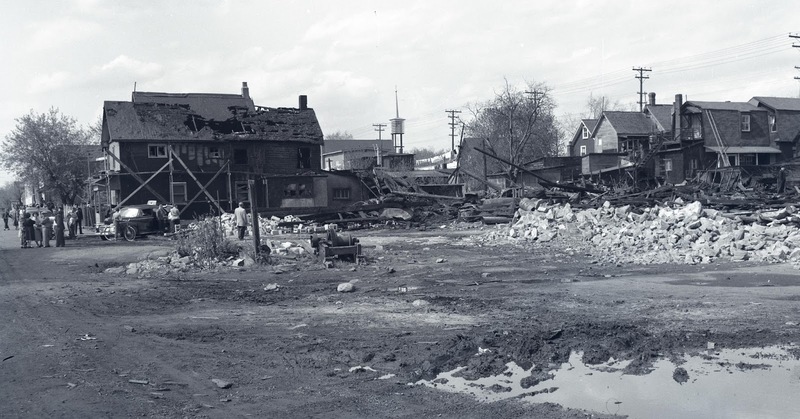 In August of 1955, 7-year-old daughter Nicole was killed when hit by a car at Parkdale and Scott, and in 1954, youngest son Denis spent two weeks a in coma after being hit by a train at Forward Avenue (he survived). 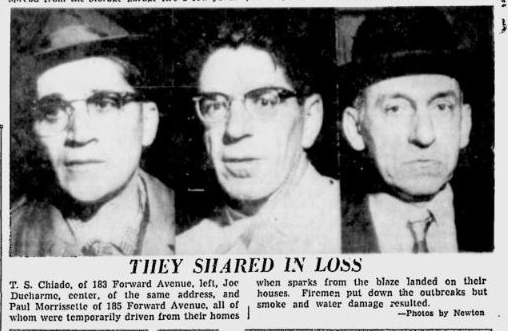 Meanwhile, next door, neighbour Leo Monette was also watching television when he heard the cries in the street, and saw the boys running past the front window. They had run to the fire alarm box (which was located at the corner of Hinchey and Lyndale) to alert the fire department. Someone else had already pulled the alarm. Frank Albert who lived at 195 Hinchey came running over, and was one of the first on scene. He had seen the smoke coming from the warehouse a block over. 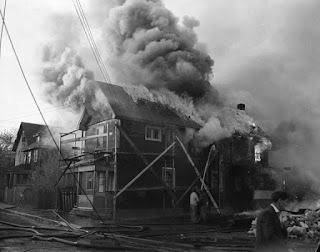 Albert and other neighbours began to help as was common in the era in the event of a fire: begin to quickly remove furniture, clothes and personal property within the houses of those affected. Thus for as long as they could, neighbours helped empty 191 and 189 Forward of as many of their contents as could be carried out in the short minutes they had before the homes were engulfed. 191 Forward was also the location of Lucille's Beauty Salon, and as much of the hairdresssing equipment owned by the Ouellette's daughter were brought outside. The first firemen on the scene included Acting District Chief Stan Pratt. He called in a second alarm, which brought Acting Chief Maynard Dolman to the fire, who saw the severity of the blaze, and called for all Ottawa fire stations and all off-duty firemen. 18 reels came rushing to the scene, and virtually all of Ottawa's firemen and their equipment from seven stations. Many off-duty firemen were called in, and others arrived voluntarily when they heard of the fire. Dolman later said that he believed on his arrival that the fire would likely "spread to the Ottawa River". At the height of the blaze, it was stated that flames shot into the sky 60 feet over the roof of the former icehouse. Hoses began to melt and burn, and windows of neighbouring homes and businesses began to crack and shatter. Residents of houses 250 feet away stated they could feel the heat of the fire in their kitchen. Early in the blaze, loud explosions could be heard. This caused great anxiety for those at the scene, as the explosions were contributing to fueling the fire, while also slowing the fire department's ability to fight it. The explosions were believed to have come from old oil drums, which were empty at the time, as well as the 15-gallon gas tank on the dump truck that was parked in the warehouse, and from its tires. Meanwhile, down the street at 183 Forward, Teck Chiodo reported that "the heat was becoming so intense" that they began evacuating. Next door at 185 Forward, the Morisette family was forced out by a flaming roof. Suddenly houses all over Mechanicsville were becoming alight. Sparks showered houses blocks from the fire. Homeowners throughout the neighbourhood battled the burning embers with buckets of water and hoses to keep roofs wetted down. Firefighters spread out over the entirety of Mechanicsville to assist, and keep watch. It would be a nervous two hours for the residents of the district. 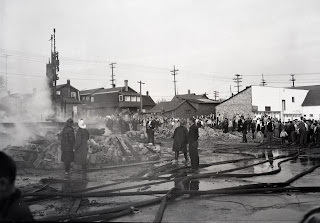 The heat from the icehouse fire became so intense that 191 and 189 Forward were fully ignited. Firemen had climbed to the roof of 191 to help battle the blaze, but were affected by what was described as "blast furnace heat". 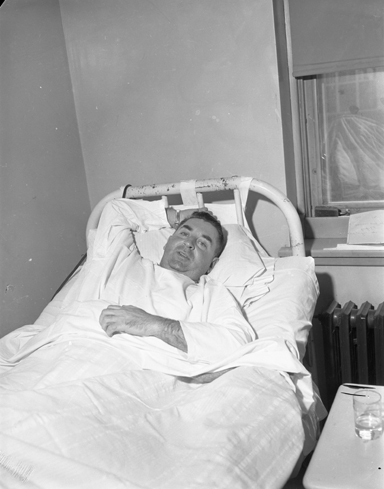 One fireman, Kenneth O'Connor, was blinded by smoke and flame, and feel from the roof. A second fireman, Len Eburne, slipped from a fence. Both men were taken to the Civic by emergency ambulance. O'Connor had broken his ankle, while Eburne was looked at for a possible foot fracture. The CPR's new "Canadian" train, on its way into Ottawa from Toronto was held up for an hour because of hoses over the track. 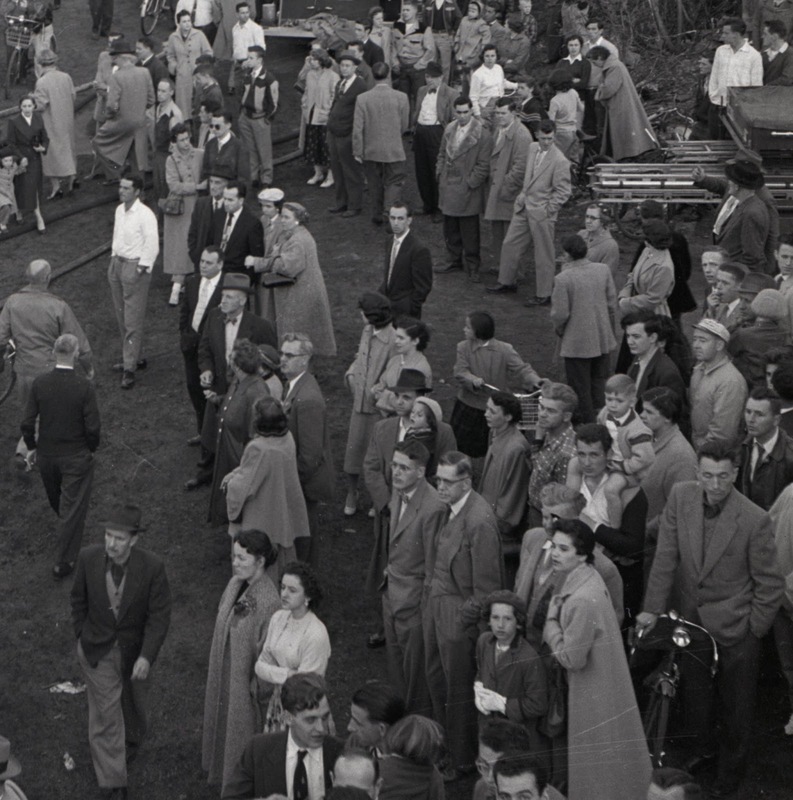 The Police were also busy, managing area traffic and also the incredible flow of spectators that found their way into the neighbourhood. Large numbers of officers were required to keep the crowd at bay. The billowing clouds of smoke brought thousands into the area. 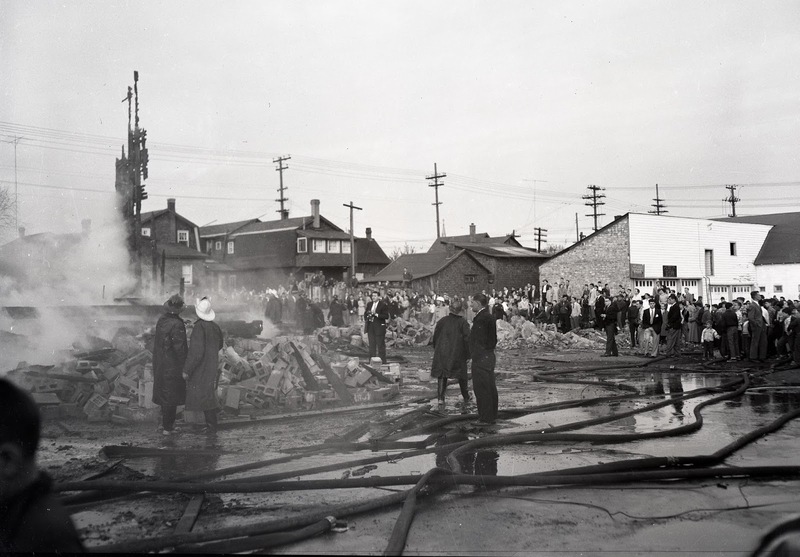 By 7:45 p.m., the icehouse was in ruins and the final portions had collapsed. The fire fighters turned their attention to the neighbouring houses, and by 9 p.m. had succeeded in calming the fire. Photo after the ice house had burned and collapsed. Police and bystanders interviewed said they had never seen a faster, more capable "stop" of a fire. All agreed that a major disaster was averted by the skill of the fire department. "I dread to think what the consequences would have been if there had been an easterly wind and it had been later in the night" said Michael Connolly of 124 Hinchey Avenue, whose house briefly was on fire owing to a spark that had travelled 400 yards. The roof of his neighbour at 120 Hinchey next door had also been on fire as well. Equally as important a factor in why Mechanicsville was not razed that Sunday evening was the luck of the weather. The direction of the wind throughout the event was southwest. Residents and fire officials agreed it would have been disastrous had an easterly wind been blowing. Surely all of Hinchey and moving east would have gone up in flames. who did suffer damage/loss in the fire. May 22 1956. Property damage was estimated in excess of $75,000. The ice house alone was valued at $30,000, though it (and its contents) were fully insured. 191 Forward was a total loss, partially insured for the $9,000 loss. 189 was severely damaged but was later restored and continued to stand into the 1990s. The three families who resided in 189 and 191 Forward were made homeless, and took temporary shelter in the homes of friends and family. Avenue in background at right. Shockingly, not everyone learned from this incident! 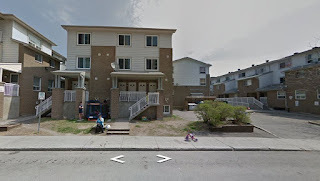 The following night (Monday night) firefighters were called back to Forward Avenue when another alarm was called in, after fireworks let off on the street sent sparks onto the roof of 86 Forward. 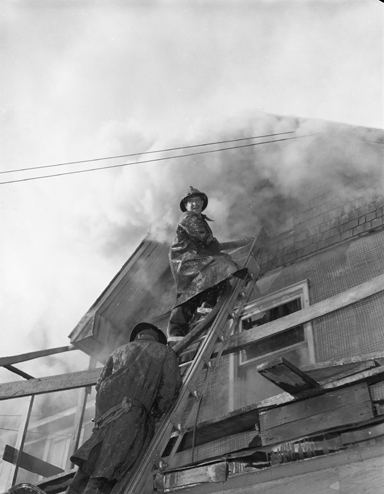 With the nerves of the neighbourhood still frayed, no chance was taken, and the fire department arrived and extinguished the smouldering shingles on the roof. A bylaw passed in May of 1955 banned the sale of "fireworks or any other dangerous article to any child apparently under the age of 16." Thus the day after the big fire, the police department stated that the store owner who sold the boys the firecrackers would face charges. No details were ever followed up on in the newspaper about the charges. The last of the Sunday evening fires was finally out at 11 p.m., around which time the police had rounded up the three kids who were responsible for the fire. The boys sat in a kitchen on Forward Avenue recounting the story to police, who told them they would not be charged "I will buy a soft drink next time", promised the oldest of the children. "Nervous Mechanicsville residents hope they keep their promise", wrote the Citizen. - 195 Forward: The Tapp warehouse (former icehouse) had within it a 1955-model three-ton dump truck and construction material (lumber, power tools and a lot of equipment). - 185 Forward (Mr. and Mrs. Paul Morisette, 4 children and a roomer): heavy fire damage to roof. The following three photos are from one larger photo looking south up Forward, towards Scott Street. 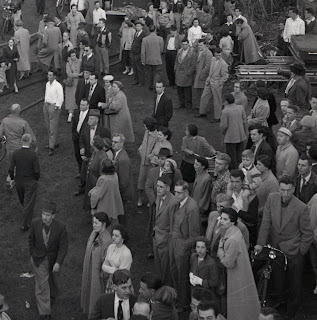 It shows a groups of some of those spectators who had assembled to watch the fire. I split the photo into three segments, which will allow for more close-ups of the people. Recognize anyone? 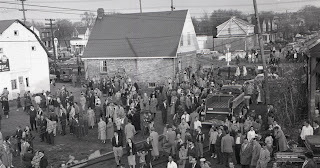 I have to believe most of Mechanicsville was out watching the fire, perhaps someone you know may be in the crowd? The new issue of the Kitchissippi Times hits the streets today, and inside it is my column on the creation of the Ottawa River Parkway aka Sir John A MacDonald Parkway. 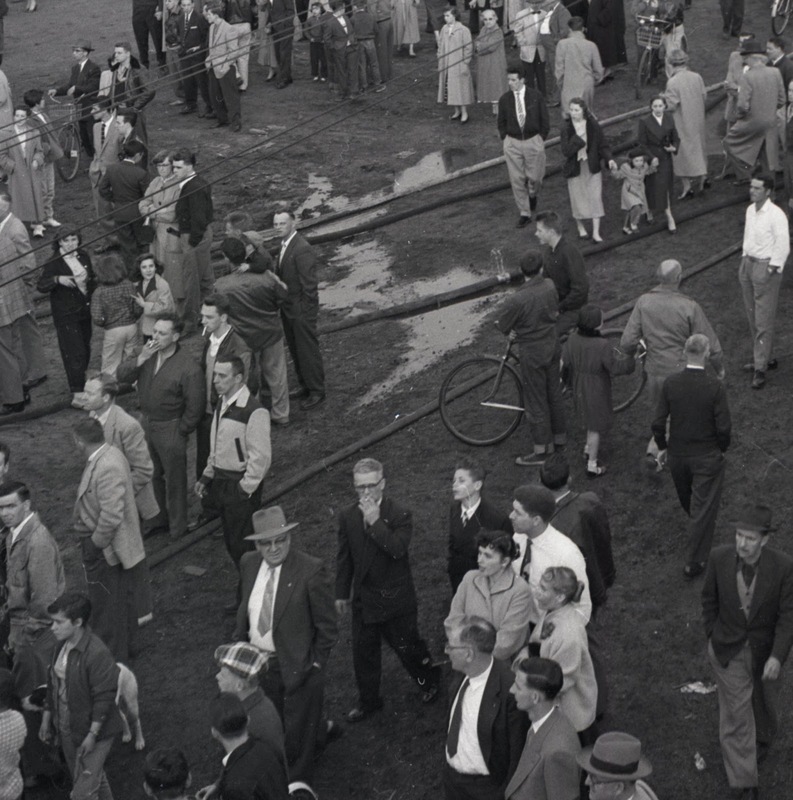 The development of the Parkway was not as fast, or as inexpensive as you might think it was. And there was far more involved than just laying some roads. Thousands of people in Kitchissippi were booted off their land when the government expropriated their property. 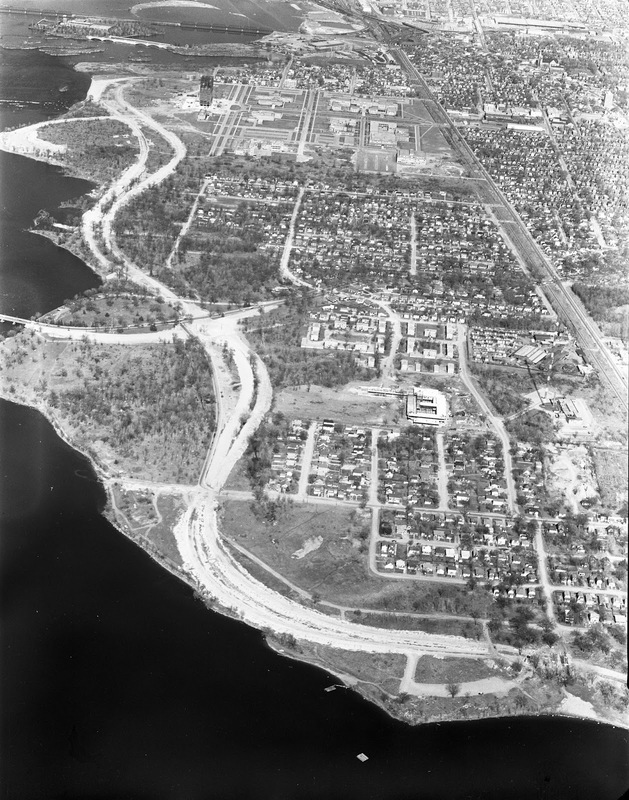 The Parkway was originally planned to be part of a ring road surrounding the City, which of course never came about. Aerial shot of the Parkway under construction.